Isn't this a fun picture of Joe. I just love Photoshop! Heck Yes! I love my photoshop! 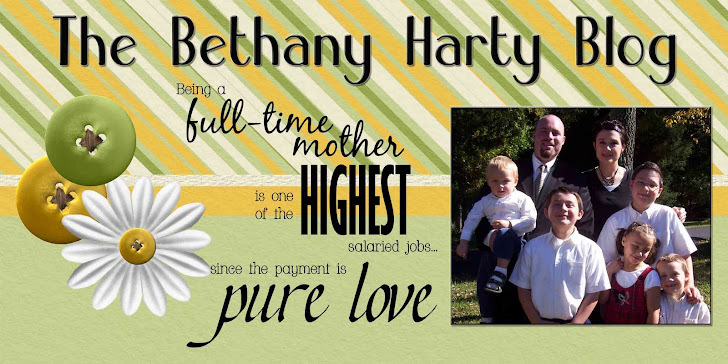 Bethany, I love your blog! I don't know where you find the time - you MUST be Supermom! Well, my youngest is now 19 months old, so that's a little more freedom than yours at only 1 month! And my oldest is 9, which makes him a great big helper. Give it a few more years! I forgot to mention that your kids are ABSOLUTELY adorable and you look FABULOUS!! HOW DO YOU DO IT?! Well, you see I"m obsessed with food. I know the calorie content of everything that I eat. Ask me whats the calorie content of almost anything base food, and I can tell you! I know, it's pathetic. But, after Eme was born, I lost 55 lbs, and have kept most of it off for 2 more pregnancies. I have only about 5 more lbs left from Jim. I eat about 1500 calories a day, split into 3 meals and 3 snacks. Let me know if you want to know more. I have detailed menu and shopping plans that I worked out last year. It works for us! I'd love to know more! You can email me when you get a chance.